Next month is our big red wine and chocolate tour! Liven up your winter with an amazing trip to the Olympic Peninsula for a weekend of delicious wines and creamy chocolate. Featuring a host of unique sweet and savory combinations, the Red Wine & Chocolate Tour takes place two weekends in February, Feb. 9-10 and Feb. 16-18 (Presidents’ Day Weekend) from 11 a.m. – 5 p.m.
Of course, this is a wonderful event for couples to share. Take a weekend to relax on the scenic Olympic Peninsula and enjoy trying some award-winning Washington wines. Meet the vintners and other wine lovers. Have a unique, romantic Valentine’s weekend. Tickets may be purchased at participating wineries during the event or beforehand on the Olympic Peninsula Wineries website. The $30 ticket and glass package entitles you to a special commemorative wine glass, complimentary wine tasting and delectable samples of chocolate at each winery during the Red Wine & Chocolate Weekends. 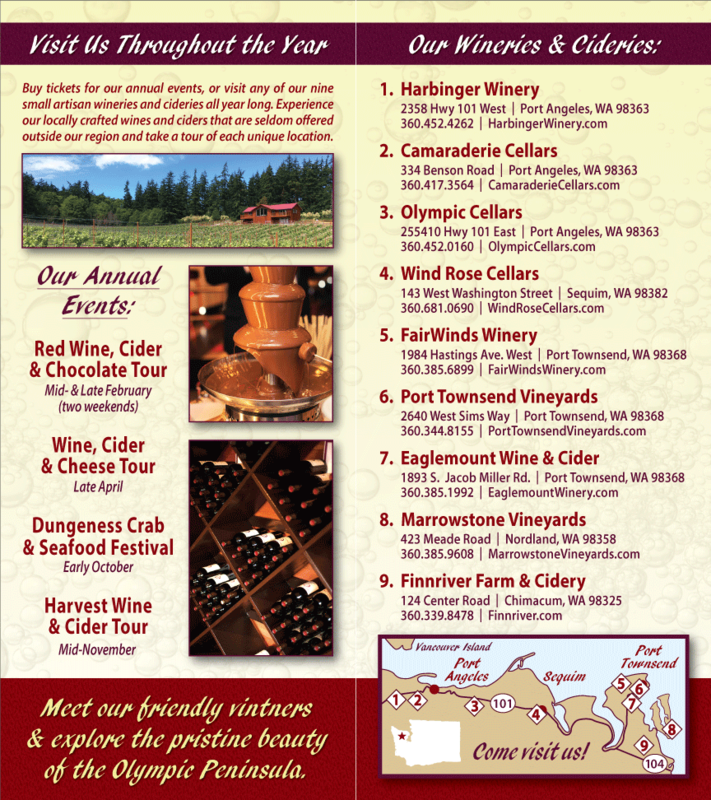 The 2012 Red Wine & Chocolate tour featured a chocolate fountain at Fair Winds Winery in Port Townsend. Fair Winds Winery: Last year, Fair Winds released their latest vintages of its Gewürztraminer, Port O’ Call and a Cabernet Sauvignon/Merlot blend. Guests experienced the tallest chocolate fountain on the Peninsula with an assortment of fruits and sweets to dip in the rich dark chocolate. Patrons had the opportunity to tour the winery and its operations, with occasional barrel tastings. Camaraderie Cellars: Featured a Syrah, paired with a cocoa spice-rubbed pulled pork, cooked on site in the winery’s wood-fired oven. The winery debuted the 2009 Syrah, along with some red blends and the ever popular Cabernet and Merlot varietals. Last year marked Camaraderie Cellar’s 20th year and special taste treats included Molly Baby chocolate shortbread cookies, Equal Exchange Fair Trade chocolate bars and a savory chocolate bruschetta. Special pricing for the event weekends should help you stock your red wine supply.